The Guide to Get Rich: Read the Writing on the Wall... It's Time for Gold and Silver! 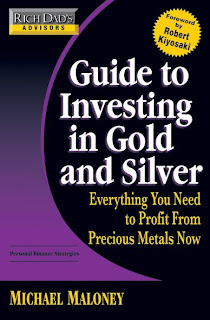 I am the New Media Communications Manager here at goldsilver.com. I just read this blog post you did on Mike Maloney’s book and it looked awesome! I emailed your blog post around to everyone here at the office and they all thought it was great! We would like to send you a free signed copy of Mike Maloney’s book. Email me back with your address and we will get a copy out to you as soon as possible.